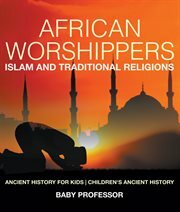 The item African worshippers: islam and traditional religions, Ancient History for Kids, Various Authors, (ebook) represents a specific, individual, material embodiment of a distinct intellectual or artistic creation found in Charlotte Mecklenburg Library. The world is huge. Lots of people live in it and each group has its own traditions and beliefs. In Africa they follow different kinds of religions. In this book, we'll talk about Islam and some other traditional religions. What makes one different from the other? How can people with different beliefs live next to each other? There's plenty more to learn from this book!